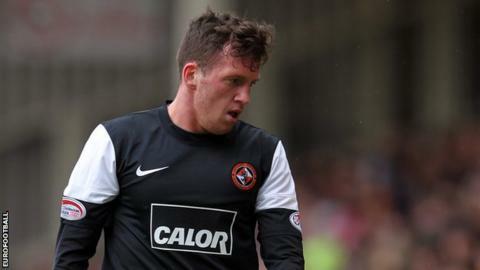 Peterborough United have signed midfielder Danny Swanson on a two-year deal following the expiry of his contract at Dundee United. The 25-year-old scored 12 times in 127 games during his three-and-a-half year spell at Tannadice. Swanson's appearances were limited last season, something he says was down to a disagreement with Tangerines boss Peter Houston rather than a knee injury. "The injury was fine since December," he told BBC Radio Cambridgeshire. "I had a bit of a falling out with the manager at Dundee United and that's why I didn't play. "People still thought I was injured but I wasn't. I was fully fit but he just wouldn't put me on the pitch. "I'm feeling brilliant. I've been back training already." Swanson, who joined Dundee United from Berwick in January 2008, earned a Scotland call-up in October last year. But he was deprived of making his international debut when he was ruled out by the knee injury which many believed had prompted his lack of chances at Tannadice. And he has cited the prospect of working with countryman and Posh boss Darren Ferguson as the main motivation for moving to London Road. "He knew exactly where and how I played and where he wanted to play me," he said. "He had done his homework. He's going to make me into a better player which is good for me and the club. "I had three other offers, one in League One and two in the Championship. There were a lot of offers there but Darren did it for me."